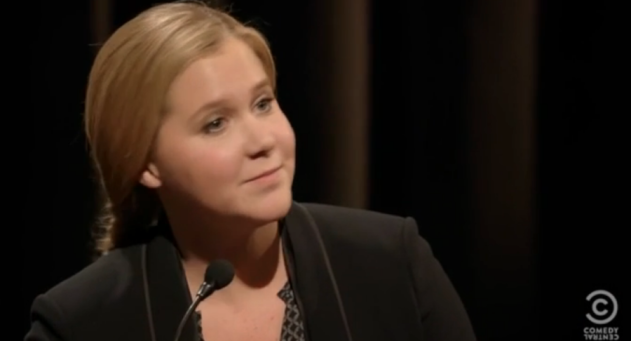 Watching Amy Schumer’s show reminds me that eradicating misogyny from the world is as much an inside job as it is a fight to be won out there. One of the many facets that I appreciate about comedian Amy Schumer’s work is that she shines a light on the cultural conditioning that keeps women in restricted places, and exposes the misogyny that many of us have internalized from living in a patriarchal society. As many of her sketches illustrate, women and girls do a good job objectifying, suppressing, and disempowering themselves. Schumer’s sketch “I’m Sorry” from this latest season is one example. In it, a group of brilliant, award-winning female experts at a conference spend an entire panel discussion apologizing for pretty much anything and everything. It’s the expert who sustains burns after the male host accidentally spills hot coffee on her who really got to me. She is writhing on the floor, blood and guts spurting out of her now severed legs, yet none of that stops her from apologizing for the disruption. Meanwhile, the other female experts are uttering their own apologies for no reason, over and over. The sketch made me think of the summer I interned at CBS News in Washington D.C. As I stood with a camera crew outside the U.S. Supreme Court in record temperatures and severe humidity, I started to faint. My lips went clammy, I felt like I was in a wind tunnel, and it was all I could do not to lose consciousness. I dropped to my knees. “Sorry!” I exclaimed to the crew. But it’s not just that one incident. I can think of hundreds of times in my life when I’ve apologized, either overtly or covertly for doing nothing more than taking up time and space in this world. Yet isn’t that what so many women have been taught? Which is another reason I’ve officially become a Schumer fan. She allows herself to take up space. She would have to be willing. Otherwise, there is no way she could create a show named after her and star in it or write a screenplay for a movie and star in it.